I had a good ride on my horse this morning – the first in nearly two weeks. Yesterday’s weather forecast promised us rain storms with thunder and lightning, but we got blue sky and sunshine so I took advantage of the fine weather. As the dog opted not to accompany me I was able to take a ride along the road, past the Bodega Jarel where they are busy making wine, and down into the valley where we turned around and took an exuberant gallop back up to the top. Liana kicked her heels and put in a couple of jubilant bucks and we arrived back at the bodega in no time at all. I have been to the UK for ten days visiting family, flying into Bristol to visit my youngest daughter Rosie. We seemed to spend most of our time in wool shops making the very difficult decision about what yarn and colour I will knit the blanket for my new granddaughter, due to arrive at the end of the year. We have decided on the same pattern as the one I knitted for my grandson Mikey, which has become an essential component to him going to sleep – it has to be placed in exactly the right position over his pillow. It gives me great pleasure that he is so fond of this blanket, as it has a bit of history attached to it. The yarn – cotton denim – was originally knitted into a jacket for me by my mother, who was a very talented craftswoman. I can’t remember exactly when she made it, but it was probably before my children were born. It was a bit of a tedious process to unpick the yarn but it was a very special feeling to be reknitting the same yarn that had run through my mother’s hands so many years ago. My daughter was delighted with it, and now Mikey loves it too. My dear old mum would have been so very happy with the result. 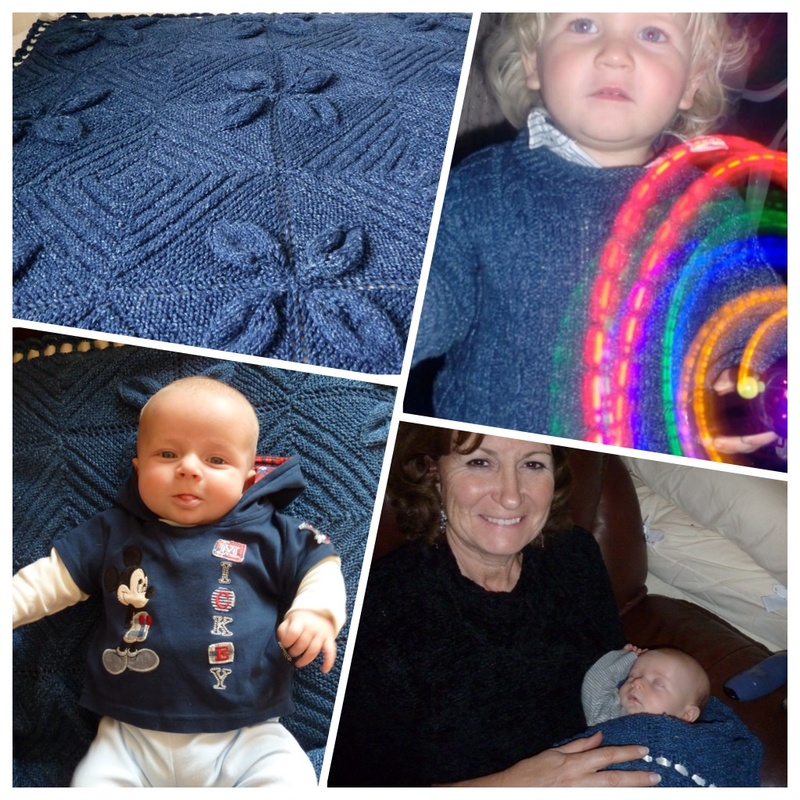 There was even enough yarn left over to make Mikey a jumper which he wore for two of his nearly four years (with the addition of a couple of extra inches knitted onto the length of the body to keep up with his growth). So now I get to make some pretty girly things which is much more fun. 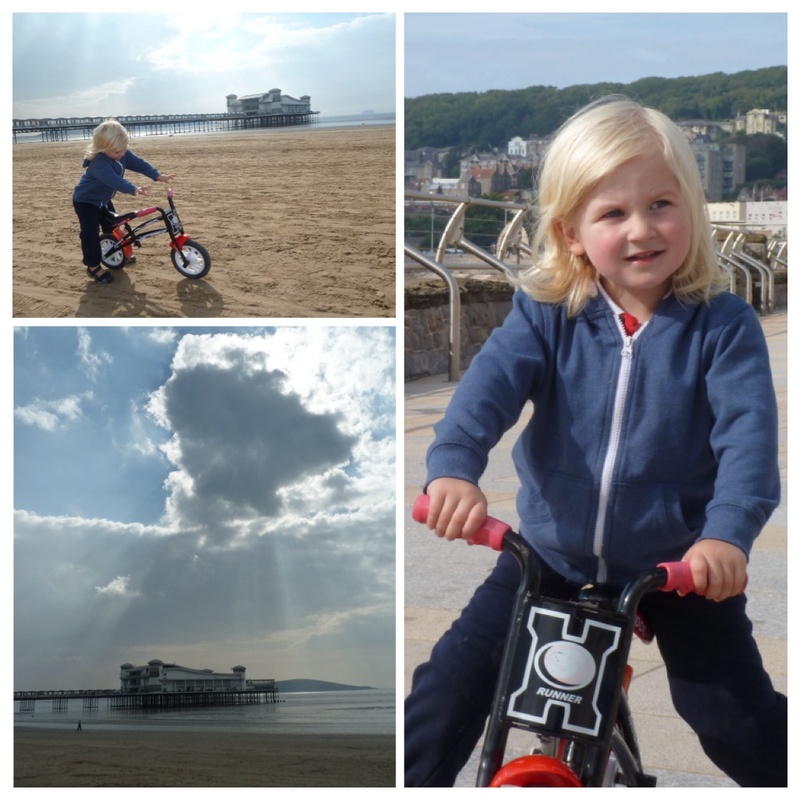 Amongst the wool shopping we managed a trip to the beach at Weston super Mare for Mikey to ride his bike along the promenade and on the huge expanse of sand. Not so many people around at this time of year and although it was very pleasant weather the clouds made a dramatic statement above the newly rebuilt grand pier. 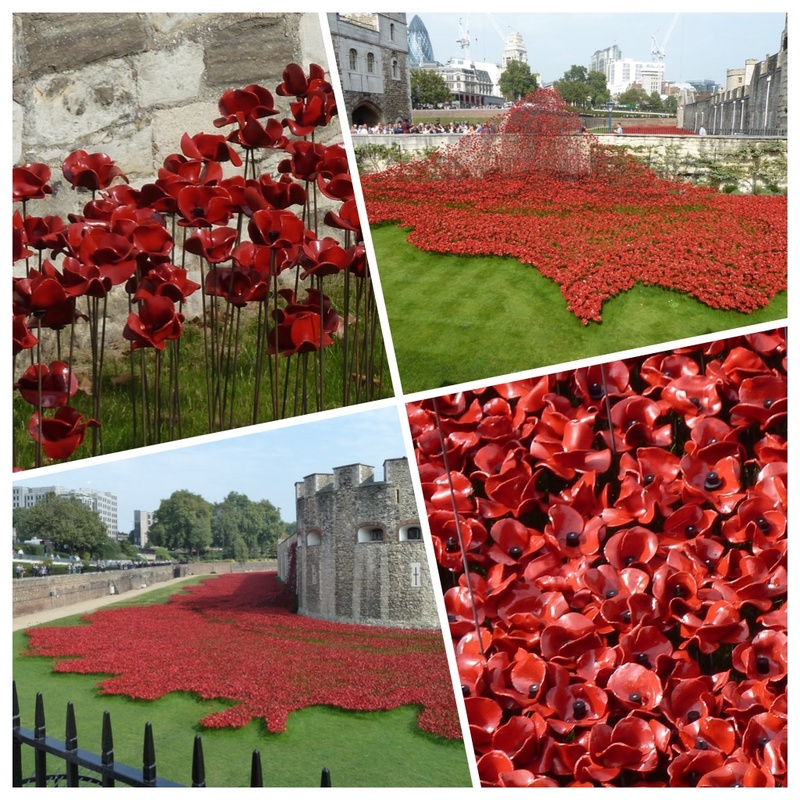 My next stop was in London as I was very keen to see the display of ceramic poppies at the Tower of London. I’m sure that all my British readers will know about this amazing memorial to the fallen British military personnel during the First World War. The installation, entitled Blood Swept Lands and Seas of Red marks one hundred years since the start of the First World War. 888,246 ceramic poppies have been made, one for each british military fatality during the war, and from 5 August (the date in 1914 when Britain declared war on Germany) until 11 November (the date in 1918 when WWI ended) the moat surrounding the Tower of London will progressively be filled with poppies. If you have the opportunity I can wholeheartedly recommend a visit – it is a wonderful and thought-provoking sight. The poppies are available for sale. They can be purchased on line and will be posted after the installation has been dismantled. I have purchased five, one for each daugher and grandchild and one for myself. I know that my daughters understand and respect the significance of these poppies and I hope that my grandchildren will grow to understand the huge sacrifice that was made on their behalf. See here for more information. I followed my visit to the Tower with a river cruise along the Thames to Westminster where I spent a fabulous couple of hours wandering along Whitehall with a detour into Horseguards Parade and a short stop on a bench on the edge of St James’s Park and then on to Trafalgar Square, back along Northumberland Avenue and across the Thames by the Jubilee Bridge, along the South Bank to Westminster Bridge and across to get the boat back to Tower Pier. It was a hot and sunny afternoon and I had a magical time. I wouldn’t have dreamt of taking such a solo trip before walking the camino – the camino experience has changed me in ways I am still discovering. I stayed the night in London with my step-daughter and great friend Maxine who looked after me really well and even drove me to Kings Cross station the next morning, after a telephone call from my partner David from Spain telling me that he had seen on the news that there were problems with the underground. If he had not phoned me I would most definitely have missed my train which would have been a huge blow as I had a ticket that was non changeable for the next leg of my trip to Leeds. I had paid the ridiculously small sum of £14 for this ticket and had been offered an upgrade to first class for just £10, so I not only had a comfortable seat but also a free bacon sandwich and as many hot or cold drinks as I could cope with. Bargain! 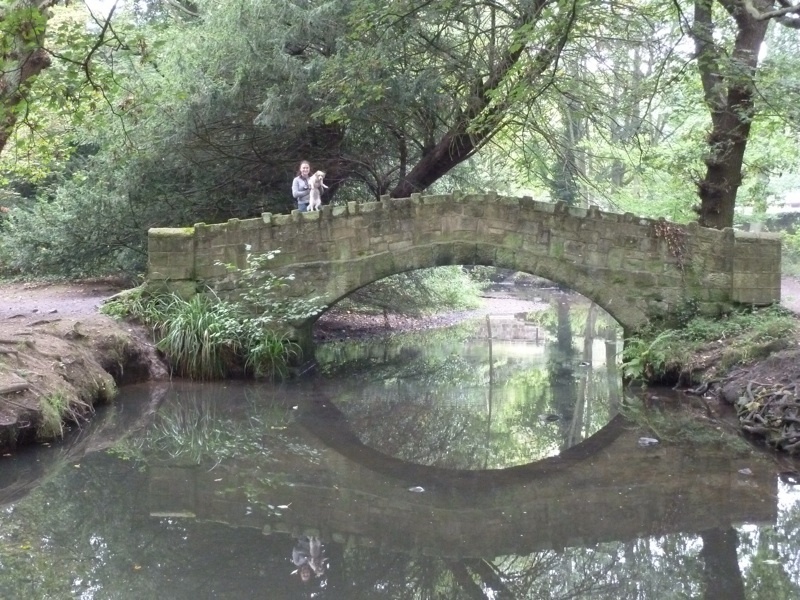 My older daughter Ella met me at Leeds station and we spent three lovely days mooching, walking the Meanwood Valley Trail (11 kms wearing Ella’s cowboy boots!) visiting York, and eating interesting food. Ella moved to Leeds after we walked the Camino Frances last year and in the meantime has found herself and excellent job and bought a house. It was my first visit to the area and I enjoyed it a great deal. I had a fabulous trip, didn’t encounter any bad weather and my jaunt ended with a return flight from Leeds Bradford airport back to Málaga. Image | This entry was posted in A view of life, Horse riding in the mountains of andalucia and tagged Blood Swept Lands and Seas of Red, Grand pier, London, Meanwood valley trail, Poppy memorial, Tower of London, Weston super Mare. Bookmark the permalink. The blanket’s coming on Tess. Eight squares knitted – only another forty to go! Only forty more squares? Piece of cake. Sounds like you had a great time Maggie. Would love to see the poppies. And nice to see pictures of Mikey’s blanket. It looks gorgeous. Hope all well. Glad you had a good time Maggie. Amazing pics as ever, especially love those Poppies. The poppies were amazing Debbie – can wait to see them up close when my purchase arrives. Although it is a shame that they can’t remain there permanently. Thanks for your lovely comment Susan. The new blanket is taking shape, I hope it will be ready by the baby’s arrival at the end of the year. Thank you Maggi (may I?) 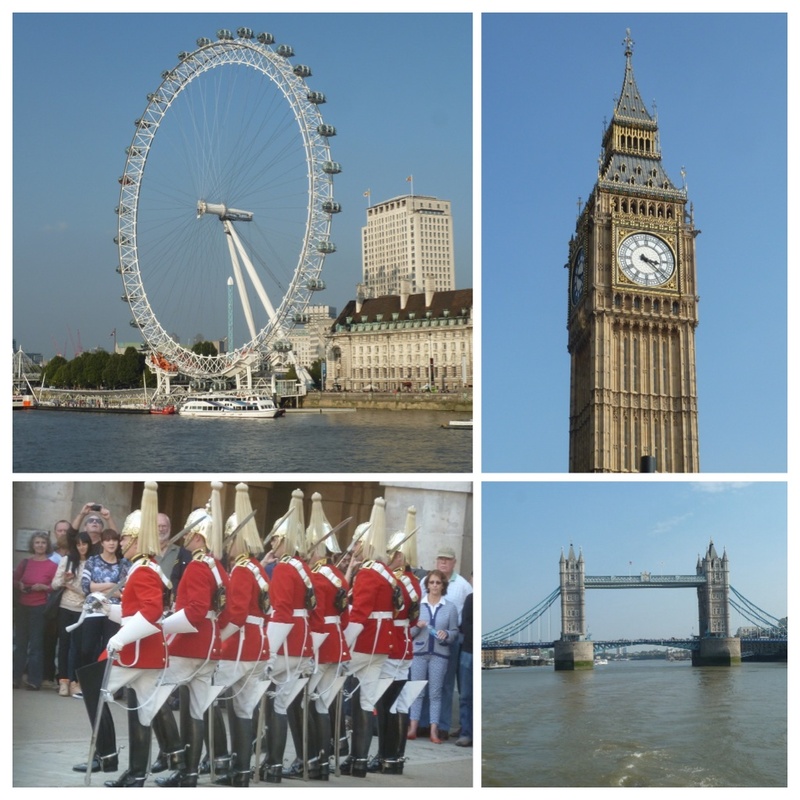 for the interesting tour of central London. 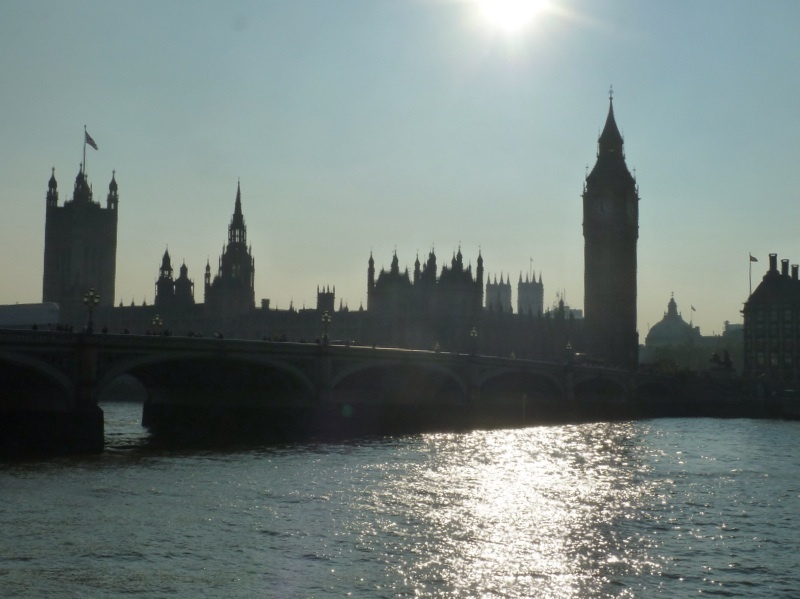 Since the visa for us SA citizens became so expensive I doubt if I will ever see London again. I enjoyed it so much. I have been fortunate enough though to be able to visit Bristol and surroundings with a friend who grew up there . Enjoy your knitting, the finished one is very pretty. Your mother must have been using a very good quality yarn at the time. I do patchwork blankets for my grandchildren and is currently busy with my fourth one. Hi Johanna, many thanks for your message. What a shame that visas for the uk are so expensive for you. How much would you have to pay? I hope you liked Bristol, it’s a lovely city but we locals tend to take it a bit for granted. I should spend a day wandering around with my new ‘camino’ eyes! 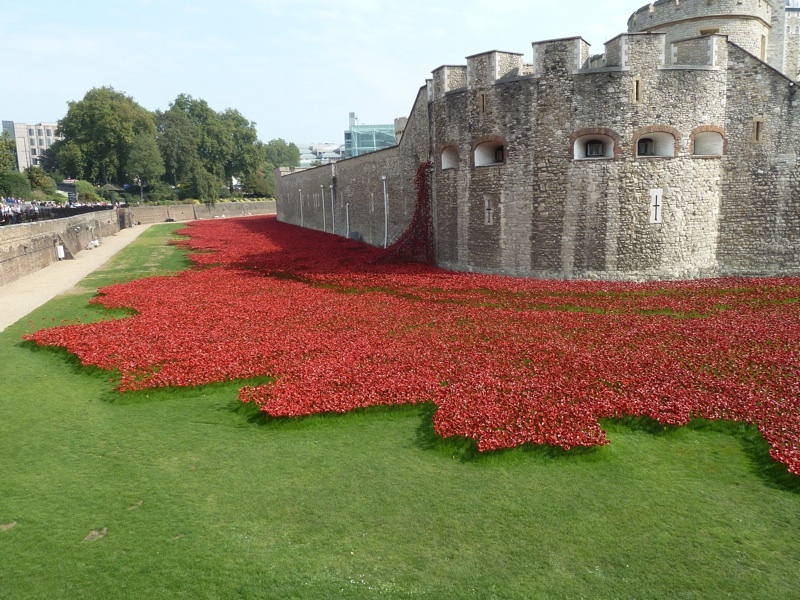 The poppy memorial at the Tower of London is spectacular – it’s a shame it won’t be there longer! but I’m looking forward to receiving my poppies after it is dismantled. The blanket is progressing, but there are so many ends to deal with – 10 squares completed, only 38 to go!. I don’t think I will need to knit any more after this one – although who knows what surprises the future may bring. And you’re on number four – well done. I’m really glad you enjoy the blog, it’s lovely to,have you on board. Beautiful photos of the poppies! Your grandchildren will really appreciate having such a special treasure to keep from it, too. I am so delighted that the blanket is so special to my grandson that he has to have it when he goes to bed. The new pretty blanket is growing bit by bit, hopefully ready for my grand daughter when she is born at the end of the year.